Vice President Joe Biden doesn’t drink beer, but he’s got no problem helping you keep yours cold. A VP-themed can koozie is the newest – and perhaps most creative – addition to the Obama Campaign’s online store, dominated by T-shirts, caps, buttons, bracelets and backpacks, all emblazoned with the 2012 logo. 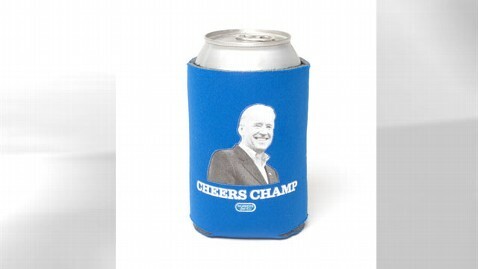 The $10 neoprene insulated sheath features Biden’s grinning likeness and the slogan “Cheers Champ.” Profits from the sale benefit the Obama-Biden re-election fund. Campaign staffers across the country have been on a messaging blitz about the new swag. @OFA_NC, the handle for Obama’s North Carolina operation, boasted that buyers could even have their “very own beverage summit,” referring to the so-called White House Beer Summit of July 2009. President Obama and Biden then hosted Cambridge Police Sgt. James Crowley and Harvard University professor Henry Louis Gates Jr. for beer and conversation after a high-profile spat about racial profiling. Obama drank a Bud Light, while Biden opted for a non-alcoholic Buckler. Both drank from glass mugs, not cans.